The mission of Christian Leadership Alliance is to equip and unite leaders to transform the world for Christ, and the Alliance salutes the life and legacy of a leader who did just that, Rev. Billy Graham who went home to be with Christ after a faithful life of 99 years on Feb. 21, 2018. His was indeed a life of kingdom impact. In salute to the life and legacy of Rev. 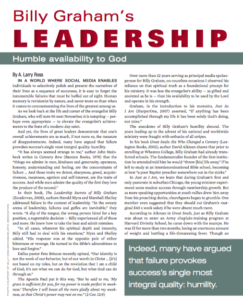 Graham, we are sharing a poignant 2014 Outcomes article by A. Larry Ross, exploring the humble leadership of this world-changing leader “Billy Graham’s Leadership: Humble Availability to God”.